Neuro ATP is a bioavailable stabilized Copper (I) enriched with DHEA, Pregnenolone, and Vitamin D that supports the body at a molecular level. The body relies on Copper (I) to fulfill a variety of functions within our cells. There are two main types of Copper; Copper (I) for human absorption and Copper (II) for plant absorption. Copper (I) completes what is known as the Electron Transport System that creates a majority of the human body’s ATP, the fuel that produces energy for the body to function. Copper (II) is the oxidized version of copper that is commonly found in multivitamin supplements that may not be utilized efficiently by the cells of the human body. When the body is deprived of Copper (I) there will be cells within the body unable to produce 90% of energy they need to properly function that can also affect neurological pathways. This has shown to lead to lack of energy, reduced mental clarity, and physical discomfort from the overproduction of lactic acid. 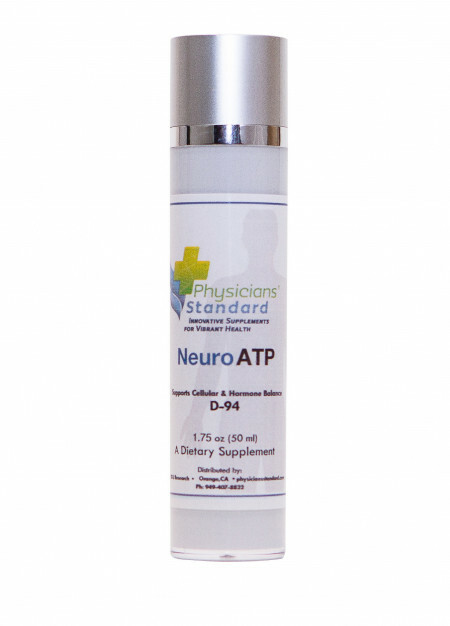 Our special patented DHEA and Pregnenolone are identical to the body’s natural DHEA and Pregnenolone, and therefore offer maximum support for tension and migraine headaches and those starting to feel the effects of aging. With Vitamin D added, it supports the “D-ficient” that may increase the risk of many chronic illnesses. Research from over the past decade proposes that vitamin D plays a wide range of combating disease than originally thought. WARNING in CA : NOT FOR USE BY INDIVIDUALS UNDER THE AGE OF 18 YEARS. DO NOT USE IF PREGNANT OR NURSING. 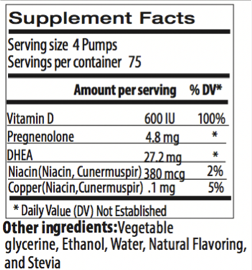 Consult a physician or licensed qualified healthcare professional before using this product if you have, or have a family history of, breast cancer, prostate cancer, prostate enlargement, heart disease, low “good” cholesterol (HDL), or if you are using any other dietary supplement, prescription drug, or over-the-counter drug. Do not exceed recommended serving. Exceeding recommended serving may cause serious adverse health effects. Possible side effects include acne, hair loss, hair growth on the face (in women), aggressiveness, irritability, and increased levels of estrogen. Discontinue use and call a physician or licensed qualified healthcare professional immediately if you experience rapid heartbeat, dizziness, blurred vision, or other similar symptoms. KEEP OUT OF REACH OF CHILDREN.